The Repsol Honda Team rider will be out of the competition for at least three weeks following a fall yesterday in Le Mans which resulted in three fractured vertebrae. 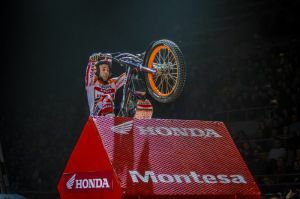 Toni Bou suffered a major fall on Sunday night while disputing an X-Trial event in Le Mans, France. The Repsol Honda Team rider took a heavy blow against a concrete element, which saw him forced to abandon the event before being taken away for an examination at the Le Mans hospital. Today, Monday, after medical tests performed by team doctor Joaquim Terricabras at the Consell Català de L’Esport and the Creu Blanca Clinic of Barcelona, it has been confirmed that Toni Bou has suffered a fracture of the right apophysis transverse of the lumbar vertebrae L2-L3-L4. Dr. Terricabras has recommended rest from all sporting activity for the rider, stating that the evolution of the injury will dictate when Bou is able to return to action, although it is unlikely to be any time in the next three weeks.